Leaders unite for devolved powers Jump to media player The leaders of pro-Union parties in the referendum on Scottish independence say they are united in their support of more devolved powers for Scotland. Sturgeon sets out interim constitution Jump to media player Nicola Sturgeon sets out the "steps that will follow" a "Yes" vote in the referendum to establish Scotland as an independent state. The leaders of the three pro-Union parties in the referendum on Scottish independence have stood together to reaffirm their joint support for Scotland remaining within the UK. 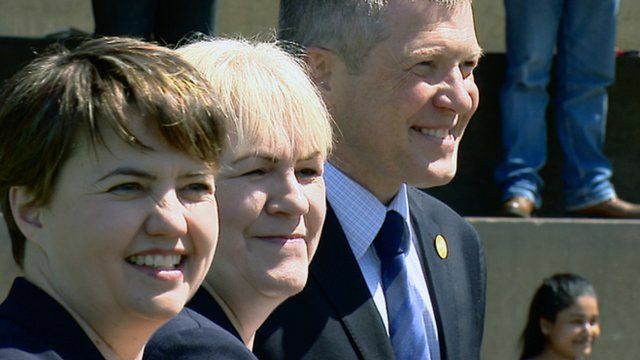 Willie Rennie, leader of the Scottish Liberal Democrats, Ruth Davidson, leader of the Scottish Conservatives, and Johann Lamont, leader of Scottish Labour were speaking at a photo call on Edinburgh's Calton Hill. All three parties have promised to seek greater powers for the Scottish Parliament in the event of a "No" vote in the referendum. Nicola Sturgeon had earlier set out the Scottish Government's vision for the constitution in an independent Scotland.